The sawyer and what he is. | Launceston Then! Prior to 1878 no village carpenter was regarded as equipped without a saw pit. Country places in those days, the carpenter stood for much more than just a wood worker, responding to the demands for an undertaker, wheelwright, painter and house decorator, while often the more successful also running a dairy farm, a livery stable, and sometimes a public house. The pit, or rather saw pit, was dug out of waste roadside land, and it was anything like twenty feet by five by six feet deep. Heavy wood carriers were placed across the pit, and the huge tree trunks and baulks were levered from their dumping ground nearby on to these carriers, and after being secured by iron clamps the process was simple. It will be seen that the roadside idea was a cute move for unloading and storing the giant oaks and elms, and for that a nominal rent was charged. The Reverend Henry Turner Hooper mentioned in his memoirs of 1934, that as a boy in Lewannick, he could recall that by the cross just before going down the steep hill towards Two Bridges, that there was a sawpit there. Sometimes the pit was a part of a village green, and this would become the centre of amusement and sport for the youths with ample seating for the older ones. The task was by no means a one man job, far from it. The top sawyer was the leading hand and his duty was to see that the saw kept to the line, while the man under, though he has certain shelter, made the long pull. Kept the wedge (wood) in position for clear cutting and worse still had to keep his eyes free from the falling sawdust. The saws varied in size, but as a rule were six foot long, twelve and thirteen inches at heel and tapering to about four inches at the small end. They were made from the very best material Sheffield could then produce, and they did their work long and well. They would require careful handling and sharpening, but when in actual use, the youths and older passers by would watch their many ups and downs with great interest. The cost of these were from twenty to twenty five shillings. The last saw pit in Launceston was on Western Road at the location of East Cornwall Garage (below left) which was built upon the old pit. 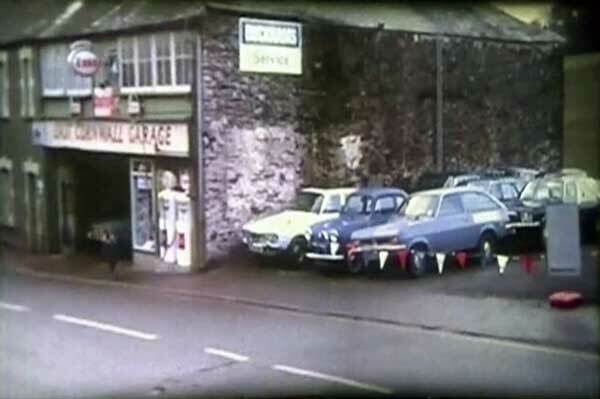 East Cornwall Garage on Western Road in 1973.